As an independent restaurant, or even a small chain, it’s easy to feel stuck in the slow lane of growth. After all, how can smaller restaurateurs afford to compete with the advanced marketing machines that let the bigger players leverage the full array of digital, social and traditional tools for bringing in customers and keeping them coming back? Today, if you want to feed more mouths, you need to get more word of mouth – and that means more effective social media. Instagram. Facebook. Pinterest. Twitter. Survey your customers, even informally, to find out their favorite social hangouts and start hanging out there, too. It’s not as hard as it seems; consistency and quality of your postings is more important that quantity. And look to your providers and other partners to help out – the best will provide digital tools that make it easy to create social posts and digital ads including your most popular dishes, most loyal customers or particularly colorful or charismatic employees. It’s worth the effort. 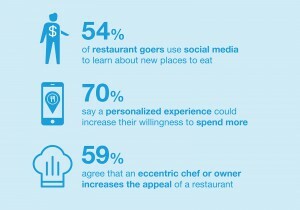 The research shows more than half of restaurant goers look to social media for dining recommendations – and for some, like fast-casual customers, social is their primary “search engine” for deciding where to eat. In addition, an even higher percentage, 68%, appreciate it when you make special offers via social media. It’s always been important to demonstrate that you know your customers, and “get” them as individuals. But this latest research also shows that it’s necessary to understand them as part of their community, and to let them understand you and your team as real people. Not surprisingly, the vast majority of restaurant patrons want to be known and appreciated as the unique people they are. That may be reflected in how your staff interacts with them, if anyone asks for or remembers their names, and if they get personally greeted upon their return. In fact, 86% agree that having a personalized experience increases the odds that they’ll become repeat customers. Personalization, however, also applies to knowing what’s personally important to them and their community. Research respondents said that “a restaurant’s community involvement can also enhance their sense of a personalized experience.” In other words, a table-top display mentioning your support of local organizations may be just as important as one touting your latest special meal. Not only do your customers what to be known, but the research shows that they want to know you, too. 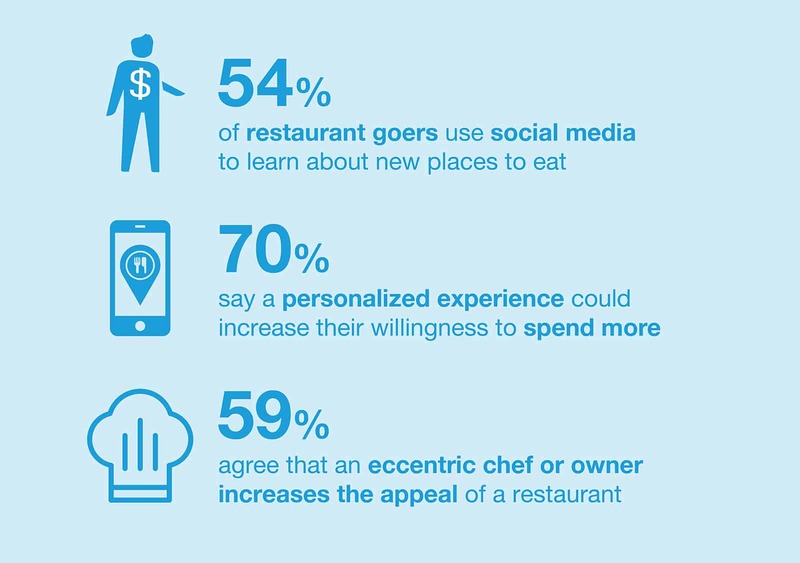 For instance, 59% of respondents agreed that “an eccentric chef or owner increases the appeal of a restaurant.” So personalization means letting your restaurant’s personality shine through. Of course, there’s no better time to increase the size of your average check than when your customer is sitting right in front of you. Yes, your wait staff should upsell everything from the dinner special to additional drinks and desserts. But don’t put it all on them. Look for natural opportunities – like the sides of your napkin dispensers or other “naturally in sight” opportunities – to get the message out on special deals, new dishes…whatever your patrons can enjoy right there and then. The road to your restaurant’s success may seem rocky, and blocked at every turn – still, you have some surprisingly simple-yet-powerful tools at your disposable to help you smooth it out and speed it up.